James became involved in running during Sophomore year at Atholton High. While attending the University of Maryland, he was a member of the Terp Runners, a club of competitive runners who trained for races. After graduating in 2006, James focused on qualifying for Boston by running a 3:07:50 at the Steamtown Marathon. Soon after, he started training for Triathlons and raced through all the distances (Sprint, Olympic, Half, Full). In 2009, he moved back to Howard County and started getting involved with the Howard County Striders. James served on the board for six years years as the successor to the Club webmaster and managed the old website as well as the overseeing the creation of the new website. In 2009, he set a PR in the 5K of 16:56 and it wasn’t until 2018 at the Shamrock 5K that he broke that record with a 16:42, a time that can qualify for the racing team. James has desired to break 60 minutes in the 10 Mile for many years and has attempted it every year at the Credit Union Cherry Blossom Ten Mile Run in DC. This year was his 14th Cherry Blossom race and he finally achieved his goal with a time of 58:27, a time that qualified him for the development team. Other goals James has accomplished include breaking 12 hours in the Ironman, sub-5 hours in a half Ironman, qualify for and compete at USAT Nationals, and break 6 minute pace for both a 10K and 10 Mile. James has a long term goal of qualifying for the Elite racing team. 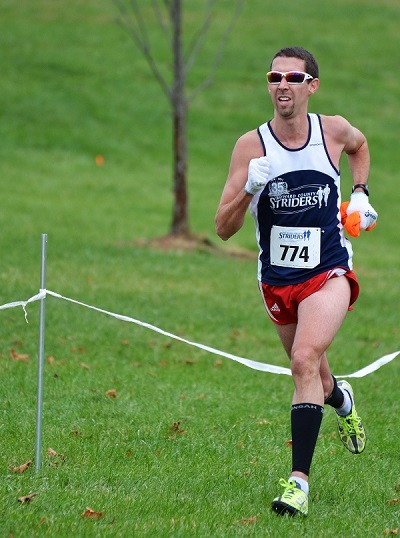 Running is his passion and he loves the community that the Howard County Striders has built.